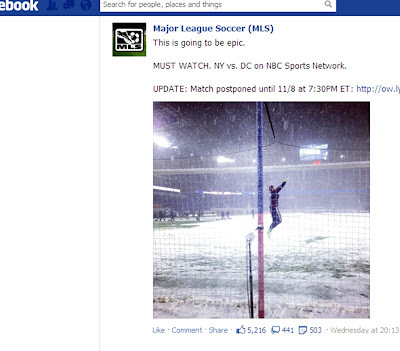 Both legs of the DC / NY MLS playoff series were disrupted by weather. After having the 1st leg venue changed from NY to DC because of Hurricane Sandy the 2nd leg had to be postponed due to a snow event. There is a lot to say about this series but I want to take a closer look at what happened during the 2nd leg snow event. The game was scheduled to be on Wednesday, Nov 7th and I was all ready to see DC take down NY. I was pretty excited for the game because reports a couple days before were for snow. Snow games, no matter the sport, make for good TV viewing. That in mind, I flipped on the TV and saw that there was indeed, pretty heavy snow falling and covering the field. Players were in the tunnel ready to go and there were people out on the field trying to clear it off. As time passed NBC Sports started to wander about interviewing coaches and players. There was a certain amount of drama to the situation that I enjoyed. Color Analyst, Kyle Martino's interview with Ben Olsen (DCU coach) was great. Olsen was all for playing. Later Martino found his way over to Hans Backe (NY Coach) who was completely against playing. In the middle was a handful of nervous MLS Executives. Notably: Don Garber, League Commissioner and Mr. Nelson Rodríguez, Executive Vice President of Competition, Technical and Game Operations. As the snow was falling both Mr. Garber and Mr. Rodriguez could be seen strolling around the facility talking with each other and sometimes talking with Martino on camera. Everyone seemed to want the game to go on but as each of them looked over their shoulder they could see that the field just wasn't getting cleared fast enough by the folks with snow shovels. Watching these people trying to clear a field 75 yds x 120 yds was painful. At first I figured it was a handful of facility employees and groundskeepers but as camera's closed in it was clear that most were young and in normal attire. Taking a closer look at some of the images shows some folks that look like they are from the front office even. Some with gloves and heavy coats and some without. Even though the forecast days before was calling for moderate snow, everyone working at Red Bull Arena just looked unprepared for it. Despite the incredible efforts of the people with shovels (some folks running) it was clear the snow clearing effort was not working. While I'm sure most would just say, "heavy snow, cancel the game." Or, "Just play on the snow." I was working out in my head how you clear the snow in 15 minutes and how you clear it in 10-15 minutes at half time. The field is 225 ft wide x 360 ft long. A close look at the shovels and I see that most were between the 18" or 24" wide variety that some poor soul had to probably run to Lowe's or Home Depot to get in a snow storm. If one person with a 18" wide shovel were to push the snow by themselves they would have had to cross that field 240 times. 240 field crossings x 225 ft wide field is 10 and a 1/4 miles. An average to brisk walking pace is 135 steps per minute which ends up being about 15 minutes a mile. Most of the people pushing the show seemed to do it with little resistance upon each pass. However, for one person to shovel Red Bull Stadium's pitch with an 18" shovel it would have taken at least 2 and 1/2 to 3 hours. Clearly, asking one person to shovel 10 miles of snow in 2.5 - 3 hours would take a beast of a woman or man. Even with the math, that seems like a daunting task for many, even with more people. Clearly it was also too tall and order for Nelson Rodríguez, Executive Vice President of Competition, Technical and Game Operations. In order to clear it in less than 10-15 minutes it would have taken around 16 people with 18" to 24" shovels walking a a brisk pace, shoulder to should (or as they say in manufacturing 'nothin' but asses and elbows'). 16 folks with 18" to 24" shovels have now made a 24 to 32 foot wide super shovel that has to cross the field 15 times to clear it. Each human with a shovel at the end of 10-15 minutes would have walked about 2/3rd a mile. That works out to be about 15 field crossing at a total of 3375 ft.
From what I can tell from images of the night there appeared to be from 12-15 "shovel-ers". Enough to clear that field, if organized, in less than 30-40 minutes. Snow would have continued to fall during the match but player movement would have trampled enough of it down to keep things playable for 45 minutes. Once you got them on it would have been okay. While they were playing, they could have put a call to Home Depots across the area for more shovels and offer fans $250 to help clear the pitch at half and maintain clear lines in the 2nd half. I was thinking at first that they could have got a Ariens Professional Series 28 in. Two-Stage Electric Start Gas Snow Blower to clear the lines but it's cost is about 9-10 folks at $250. Plus, this is likely a one time event. Always go with people power over equipment anyway. Good old fashioned muscle and sweat is more reliable, cheaper, easier to program, safe and more plentiful than a machine and machine parts anyway. I also like working with people a lot better than machines. On top of that, can you imagine one of the folks in these pictures operating it? Might be some missing limbs by the end of the night. Major League Soccer looked lost on a lot of levels on this night and Commissioner Don Garber's message to fans apologizing(?) for mistakes misses the mark. It wasn't the weather that caused the match to be postponed, it was arrogant incompetence. Something which we unfortunately see far to often with this league at all levels. I don't doubt I'm overestimating speed and ableness - especially when you figure people would get tired after a handful of passes - or you may have to start in the middle of the pitch and work out to sidelines... regardless, solvable problem and I'm a firm believer in the ability of anyone when given clear and achievable goals. Clearing the field was achievable. Afterwards, people might have been sore but in finishing the job they would have been slapping hi-fives and fist bumpin' all around. How great if NBC would have caught that! Instead, when the word of the game cancellation was passed on to the folks who had been shoveling for over an hour I noticed a few toss their shovels to the ground in frustration. I'm sure a few viewers felt the same. Playing this game could have been really fun. It should have been played. In better hands it would have been played. Use the super shovel next time.